Here's the thing, dog poop isn't only an eye sore, its an environmental hazard, carrying with it a large range of pollutants and parasites. These parasites aren't limited to dogs either, you could catch them too! This isn't just hype in 1991 the EPA designated dog waste as an environmental pollutant, placing it in the same category as pesticides. Dog poop is not only dangerous to you and your family, collectively it can infect entire waterways, and lead to algae blooms which can choke out plant and aquatic life. 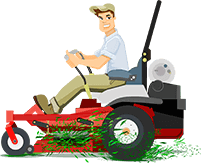 Lawn mower poop launchers aren't even the bacteria's favorite mode of travel, they prefer being airlifted about the yard on insects and other pests, its like they have private helicopter pilots or something. When there aren't any bugs or pests about they will just simply catch the wind, and settle in your soil or groundwater where they can stay for a year or longer! As you can see there really are many dangers of dog poop being left unattended. Prevent this parasite circus by scooping your dogs poop. Also be sure to teach your children the dangers, and never scoop poop, dog or cat, when pregnant or nursing. Now that you know the dangers of dog poop be proactive, all of those terrible things can be avoided. How should you handle Clean up and Avoid Spreading Disease? Simply scoop your dogs poop with a small plastic baggy, tie it up and throw it away, it will only take a moment. If you don't like the idea of throwing it away, consider an in ground digester system. These systems can be small and easy to install. They work as a contained unit which digests dog poop using an enzyme solution. The digester then liquefies the poop, which drains into the ground. More on them here. If you don't want to clean it up you can always hire someone, there are sites like http://www.doodycalls.com that can help you find them. Also remember to keep your dog away from the poo of other dogs, and for goodness sake no mulching the poop into your yard! Be sure to share this article with your neighbor, yeah you know the one. Send this article to them, or print it out, and I'll give them the “what for” you have been wanting to give them all along. Have you ever wondered why your dog is eating grass? Do you have brown spots not caused by dog poop?